Mielie Meal or pap is a classic South African staple food in South Africa. It is very popular at braais served with a rich tomato relish and South Africa’s favourite,yummy boerewors. Mielie meal is very similiar to the well known grain, polenta but it is white in colour. In this recipe the mielie meal or pap is cooked quite stiff, which is perfect for mopping up the gravy and the meat juices. Enjoy at your next braai or barbeque! In a bowl mix the maize meal with 1 cup of water until smooth and lump-free. Bring the remainder of the water and salt to a boil in a large heavy saucepan. Add the mixture to the boiling water and stir till the mixture becomes thick. Reduce the heat and simmer for about 20-30 minutes stirring occassionally until completely soft and fluffy. Grill the Boerewors in a pan over a medium-high heat for about 10-15 minutes, turning often or until cooked to your liking. Heat the oil in a saucepan on medium heat. Cook the onions with the green chilli and garlic until soft and translucent. Add the canned chopped tomatoes, the tomato sauce, sugar and salt . Cook for approx. 15-20 minutes or until the sauce thickens,stirring from time to time. 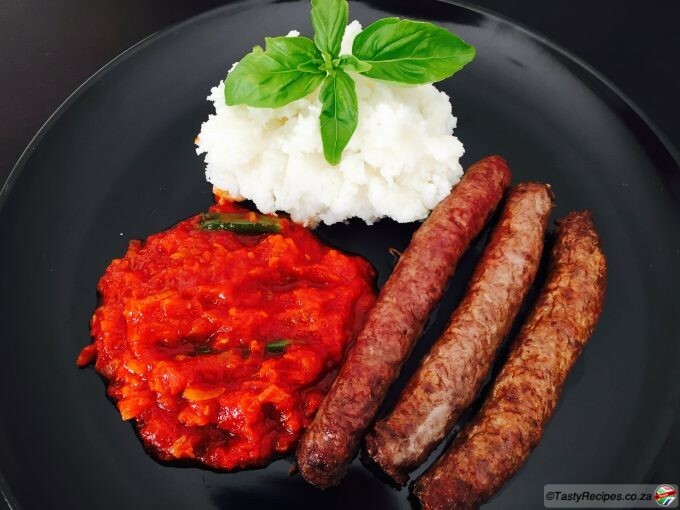 Place the boerewors on a platter and serve it alongside the pap & the tomato relish and a side salad.